We think that remodeling or renovating your kitchen is a great start freshen up your home before the year comes to an end. Believe it or not - that's right around the corner. That's why we spent some time compiling some of our favorite trends of the year so far. Let's take a look! Kitchen color trends vary from year to year. Gone are the days where kitchen cabinetry is just a single neutral color. Instead, invigorating color choices are in. In 2017, we saw a trend shift towards grey and blue kitchens. In 2018, it's been all about purple kitchens because Pantone's color of the year is ultra violet. Black fixtures and faucets have also been trending for 2018. We think that black is classic because it works with just about every style and color palette. Our tip for using dark colors would be to pepper a few other dark or black elements throughout the room so that it doesn’t feel completely out of place. Dark colored furniture is also something to consider. 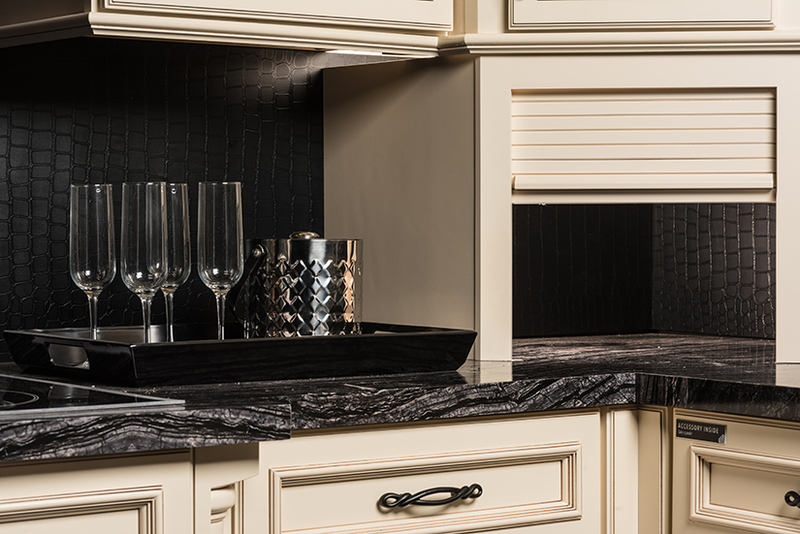 Black or dark grey can easily be combined with traditional colors like white or wood finishes to create a statement in your kitchen. 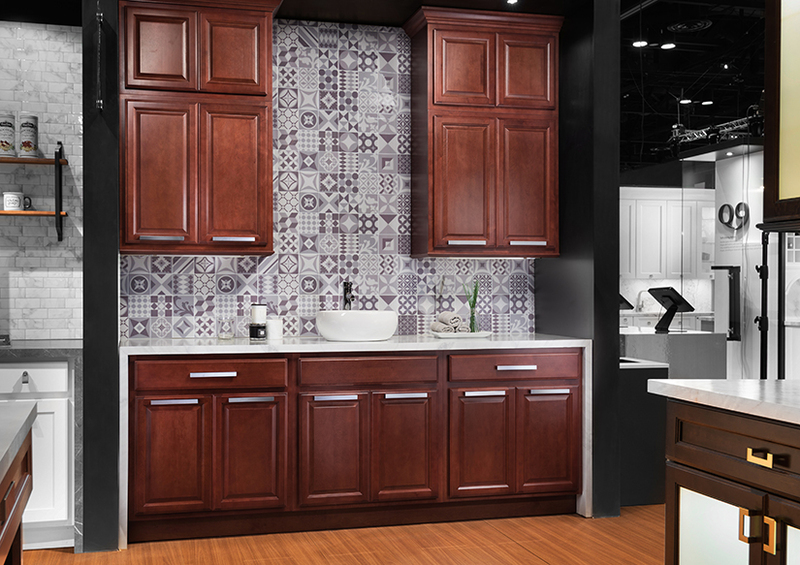 Two-tone design selections started to pick up steam in 2017 and will continue to be one of the hottest kitchen cabinet trends at least until the end of 2018. The trend was ignited by contrasting islands, where the center island is painted a different color than the rest of the kitchen cabinetry. Taking this color principle into greater heights, most new kitchens tend to combine two colors for their overhead cabinets and base cabinets, as well. In 2018, there has been a big focus on maximizing counter space with high-tech storage systems. By removing clutter from your countertops, your kitchen will immediately appear more open and inviting. 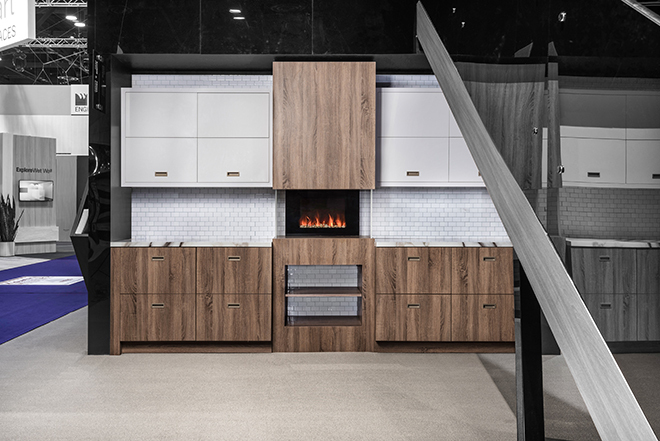 Everything from toasters to coffee makers have made their way into individualized appliance garages adding to the overall minimalist look. We love this practical trend! To personalize and add refinement to your kitchen, incorporate bright tiles on walls or backsplashes. Why choose one color or style when there are so many unique patterns and color schemes to consider? Introduce patterned tiles with geometric prints on accent walls or combine classic elements with modern ideas to impose eclecticism in your kitchen space. A splash of metallic in your kitchen makes for a great focal point. It seems to us that the golden/brass hardware trend is here to stay. We’ll take it one step further and say that metals are timeless. This is best incorporated with faucets or drawer handles. Copper is also still trending, so get used to it. If done right, metals are one of those things that will always be in fashion, so you can't go wrong. So, which of the above kitchen trends are you loving? Do you already have any of these in your kitchen? Let us know your thoughts and if you have any other trend predictions in the comment section below!